For active families, an outdoor action packed Thredbo holiday wins hands down over other destinations. Thredbo is tops and April is the perfect time to get out and about in the mountains. Having brought our kids up in Thredbo we know all about keeping them active and there are plenty of things to do. Of course there are the big drawcards like conquering Mt Kosciuszko, downhill mountain biking and Thredbo’s attractions like the Bobsled and fun in the leisure centre but the top 10 tips below are all winners and many of them are FREE. Here are our Top 10 Thredbo activities for kids holidays in April to get them outdoors and busy. 1. Jump Down the stairs on the Merrit’s Nature Trail. For kids 5 years and up on a family Thredbo holiday, this can be a fantastic way to burn energy and see some unique mountain scenery. The Merrits Nature trail is a 2 hour walk from the top of the Kosciuszko Express chairlift back down to the village. Scramble on the boulders in the Merrit’s Falls, at the top of Merrits Creek. Explore a magic forest of towering Alpine Ash trees with a lush understorey of ferns that would make most kids think of hobbits, elves or other mystical creatures. Visit the Wombat Camp forest hide away or throw stones in the beautiful Merrits Creek as it tumbles past you in a pristine glade near the bottom of the trail. There are plenty of stairs on this track and the spacing on some is a little long for kids to climb easily but if you descend the track then it takes on a whole new dimension of fun. Our kids loved to jump down them as they went and with so many sights to see along they way boredom is never an issue. Take a picnic and make a half day adventure of it, don’t forget your camera for Thredbo holiday memories! 2. Thredbo Valley Trail Bike Shuttle. The Thredbo Valley Trail is a purpose built shared use track and is ideal for a family bike riding adventure . Best suited for kids 10 years and older who like bike riding, the track is a flowing, mostly downhill ride from Thredbo to the Ski Tube and Lake Crackenback, 19km downstream following the Thredbo River. You will see picturesque mountain river scenery and get a buzz riding the huge suspension bridges. If you bring your own bikes then you can plan a ride with one parent scheduled to drive the car for a bike and rider pick up at the Ranger Station or you can book on the Thredbo Valley Trail Ride with Thredbo MTB and they will give you a guided ride with bike hire, instruction, drinks at the end and a shuttle back to Thredbo. You can Also book with Thredbo MTB on 64594119 to just catch the shuttle bus back without the guided ride. Lake Crackenback resort also offers a shuttle service that works partciulalary well if you are doing an early morning ride down. Yo can book that by calling their Activate desk on 1800 020 524. 3. Wombats for kids. Make time on your Thredbo holiday to grab a torch and go for safari night walks just on dusk to see what Alpine wildlife is all about. There are plenty of places to walk around the village where you can see night time wildlife like the riverside track, the pipeline path or even just wander along the edge of the golf course. Animals you are likely to see include, wombats, brushtail and ringtail possums, Tawny Frogmouths, Bobuck Owls and if you are very observant you might spot some dusky antichinus or the marsupial broad toothed rat. 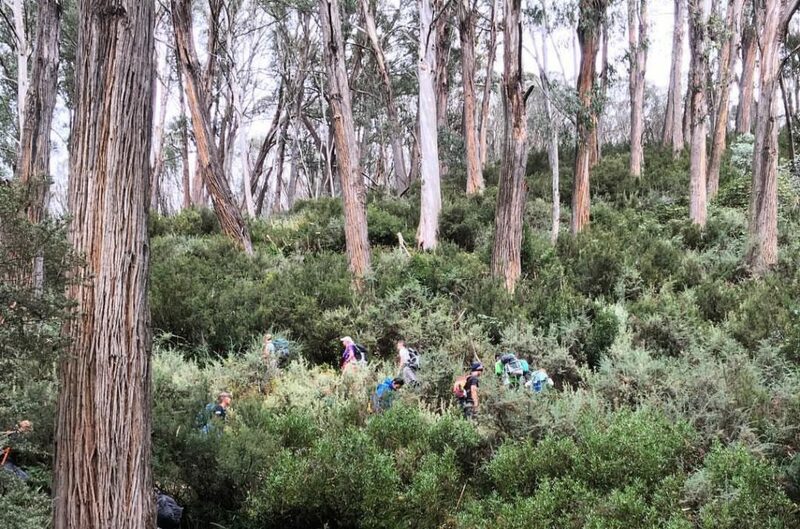 If you are keen you can drive 15 minutes to the Thredbo Diggings Campground to walk the tracks along the river which are a mecca for Wombats, wallabies and kangaroos. 4. Thredbo River Rock Hopping. The Thredbo River runs through the village and in April the water level is usually low. You can still catch trout or spot platypus but that usually takes a little patience. Our kids always loved rock hopping in the river, trying to cross the river on stones without getting their feet wet or climbing from one large boulder to another with the water flowing around below. Just wander up the river side track from the Thredbo Chapel and look for places to get up close and personal with the river. 5. Light a fire for a BBQ picnic in the national park. April is outside the bush fire season so fire restrictions don’t normally apply. The Kosciuszko National Park has some of the country’s most beautiful camp grounds and if you are looking for a great Thredbo holiday family experience grab some sausages, bread and sauce and head for the Geehi Campground, the Thredbo Diggings or Tom Groggin Campground and have a good old fashioned bush BBQ. The camp grounds all have cooking fires so you can get the kids involved in lighting the fire and cooking the snags and then take a walk along the riverside tracks in these spectacular locations to spot wildlife, skip stones in the river or explore the old fisherman’s huts. With Kangaroos, Emus and spectacular mountain scenery these campgrounds offer a real taste of this amazing national park. 6. Gaden Trout Hatchery tours and picnic. The Gaden Trout Hatchery is a government run fishery that produces trout to stock streams and lakes across New South Wales. The Hatchery is located the Lower Thredbo River 6km from Jindabyne on the Kosciuszko Rd. Gaden is a fantastic place for a picnic on the river bank with electic BBQs , plenty of grass lawn for running wild and a beautiful calm section of the river. The Hatchery does tours at 10am and 2pm. You can see some of the enormous trout that are kept for breeding in this impressive facility. Kids really love it. Brumbies can often be seen on the Ramshead Range above Thredbo Village but a favourite haunt for them is the Cascades Trail that leads from the car park at Dead Horse Gap (probably no coincidence) and heads off into the Pilot Wilderness. The car park is only 4 km from Thredbo and the the Cascades Track is a fire trail that follows the Thredbo River up to hidden high plain where the Brumbies are often seen grazing. It is only a 20 minute walk to the plain and there are spectacular views of the Ramshead Range and with the promise of some Brumby Spotting the kids can be well entertained. It is possible to get very close to the river which is a lot smaller so there are plenty of trout spotting options as well. 8. Rug Up in the Rain for a rushing Alpine River. Don’t be afraid of the rain if it does happen on your Thredbo holiday, it still isn’t an excuse to hide inside. Our kids loved donning their rain coats and boots and heading upstream on the Thredbo Riverside track to watch the gushing river cascade down the little water falls and rapids. It is an exhilarating sight and something they will never see at home. Best of all it is a good excuse for a family hot chocolate session afterwards. 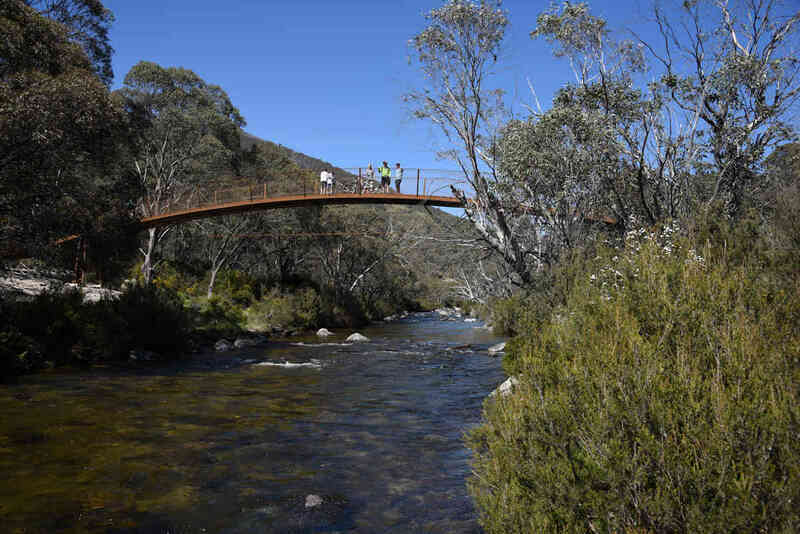 With the new Thredbo Valley Trail you can also head down stream from the village and view the torrent from the new Suspension Bridges. Another favourite game with our kids involving rivers and bridges was Pooh Sticks (Winnie the Pooh) where everyone in the family throws a stick off one side of a bridge and jumps to the other side to see whose stick comes out first. 9. Stone Skipping and Paddling on Lake Jindabyne. Autumn weather in the mountains is often very still and Lake Jindabyne becomes a glassy mirror. With a lake side track running 5km from the Snowline Caravan Park to the town Centre it is a lovely place for a family walk. When the lake is glassy, skipping stones on the water is a proven way to while away an easy half hour here and there on the track. If kids haven’t done it before they are amazed that it is possible to float a stone across the water and if they have prior experience then Lake Jindabyne on a still day is the perfect place for a world record attempt. I claim 20 skips as my personal best! The Snowline Caravan Park also has canoes for hire so if you are keen to get on that glassy water then it is a perfect way to tour the lake. 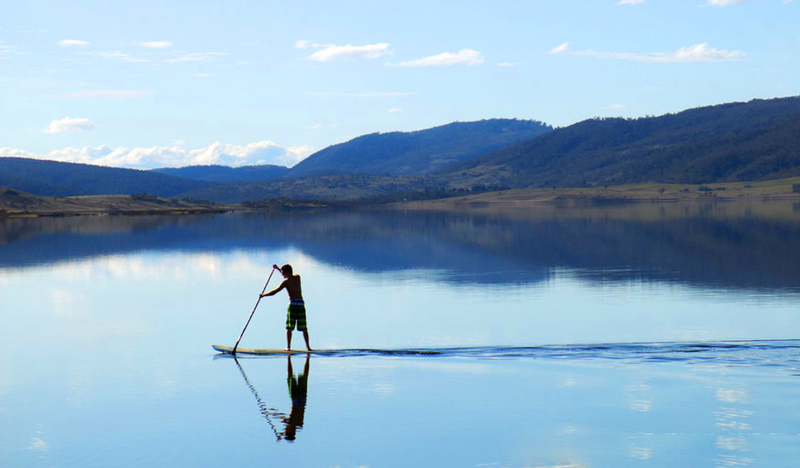 You can also retn kayaks and Paddle Boards from Sacred Ride in Jindabyne It is an easy paddle across to one of the islands which gives the kids another adventure on their Thredbo holiday; exploring the desert island. 10. Dead Horse Gap Star Gazing. If you live in a city you never really see the stars. While you are in the Snowy Mountains you should always take the opportunity to get outside at night when the sky is clear and look up. Anywhere is a good place to do it but the further you are away from any lights the better. 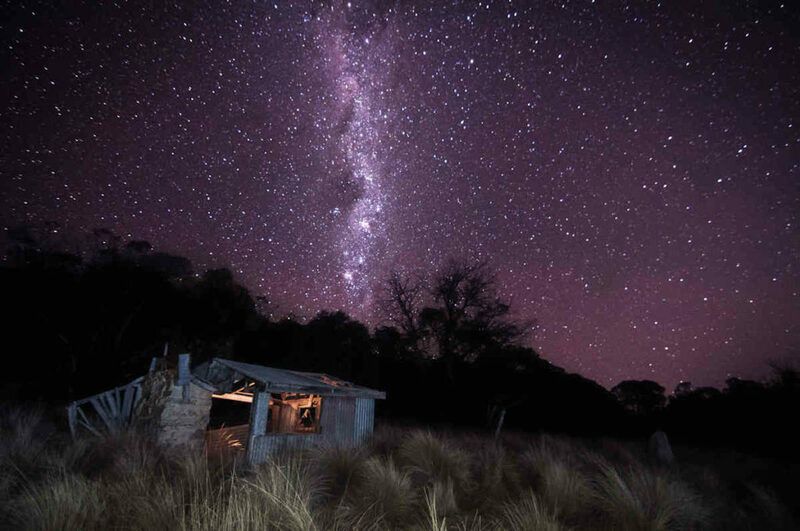 If you want to see the Milky Way in all it’s splendour, drive up to Dead Horse Gap on on a clear moonless night, take your coat and hat, turn all the lights off and just wait 10 minutes for your eyes to become accustomed to the dark. You will not believe your eyes…. These are some of the favourite Thredbo holiday activities we used to do with our kids. They were favourites because most of them were free or close to it and they are all really simple ways to connect with this beautiful part of the world in Autumn which is a lovely time to be here. Obviously there are plenty more, particularly all of the classic things like Hiking, Mountain Biking, Climbing Kosciuszko, Horse Riding, white water rafting etc… One thing is for sure, kids on a Thredbo holiday are never bored. We have our 3rd night free accommodation deals running throughout April excluding the Easter Weekend. You can book accommodation for a family of 4 from as little as $440 for 3 nights. Call us on 1800 020 598 or book online.